Yoga has always lingered in my mind while growing up. It was a distant fruit and totally un-aware of what it means and feels to venture into yogic journey. When people mentioned that they practice yoga, although I am amazed at the great postures they would easily get –into in synch with mind and body, but thought one needs lots of patience to hold onto and do it every day and make it that part of life…Which I wasn’t ready to invest time in that. In spite of running away from it several times, an accidental conversation with a stranger led me research into options of considering an alternative medicine Ayurveda. That is when I learnt about yoga being the integral part of Ayurveda and it wasn’t meant to be alienated from it. Nevertheless, now-a-days yoga has been taught independently of Ayurveda. Contrary to popular belief, It is not just a mere physical exercise but is a union of mind, body and spirit. Most importantly there is no religion attached to it. So, after lots of searching of yoga institutes, signed up for my first-ever-yoga-class-for-beginners. It was a pleasant room starting with brief chanting of mantras to create a pleasant vibration around, with slow flow of asanas (body postures), breathing exercises and ending with yoga nidra (a deep relaxation, where you are supposed to feel every single part of your bodily movements from feet to hands to head). I was so tired and slept during yoga nidra. This was part of Hatha Yoga. Felt so relaxed and surprisingly, I had a very sound sleep with no dreams that night. I am looking forward for yoga classes.. They will definitely make you feel light headed and relaxed by end of the class. So, if you think you need to get away from your hectic life, ..need some work-out.. so on so forth. Of course there are many benefits of doing yoga for mind and body..
Before you make a decision, you can try out some free Yoga classes if you live in New York City – yes – absolutely free! 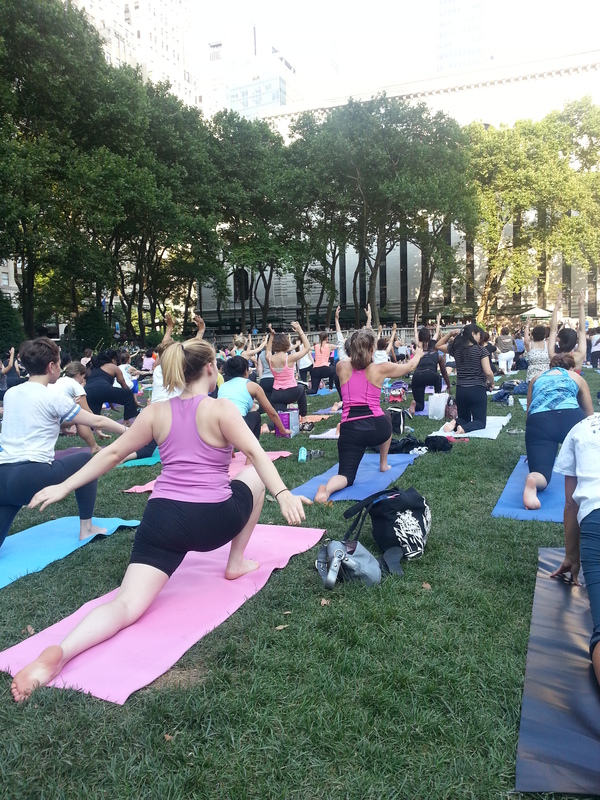 If you are part of any meetup groups, there are many who organize free Yoga classes.